On the eve of the Church commemoration of Saints Sergius and Herman of Valaam (June 28 O.S. ), the monastery had its own feast, the tonsure of Riassophore Monk John (Weeks) to the Small Schema and Novice Stephen (Manduke) to the Riassa. This grace-filled event took place just as the Church is finishing the fast of the Apostles. 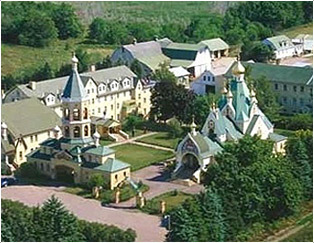 For the elder fathers of the monastery brotherhood, this sacred event was not only a joy as we see our ranks replenished and strengthened, but also a reminder of our own vows and very importantly, a witness to our many pilgrims who perhaps for the first time were able to observe such a commitment to Christ. Fr. John is an American convert to Orthodoxy who left his home to dedicate himself to his salvation here in our monastery a few years ago. His obediences have involved the care of our elderly and sick brethren, cleaning church and taking care of our mail. He also corresponds with men in prison, encouraging them in their struggles. In monasticism he has been given by our abbot, Archimandrite Luke, the name of the Apostle Paul. Fr. Stephen comes from the family of a priest. His father is Fr. Nikolai Manduke. At a young age he has decided to dedicate his life to his salvation in monasticism. It is interesting to note that he has a relative among the New Martyrs and Confessors of Russia, the Hieromartyr Vladimir Medveduk, his great uncle. He has now started upon the next step to the angelic life. May our Lord strengthen both him and Monk Paul, and may the Most Holy Theotokos guide them on their path to Christ.